Eyender (pronounced “eye-ender”) is a boss found exclusively on EMC. It was released as part of the Survival Updates. Eyender can be battled in the Overworld and Nether. It is very strong and agile, which means even powerful swords only strike small amounts of damage, and it can evade arrows by teleporting. It is, however, vulnerable to Ender magic. 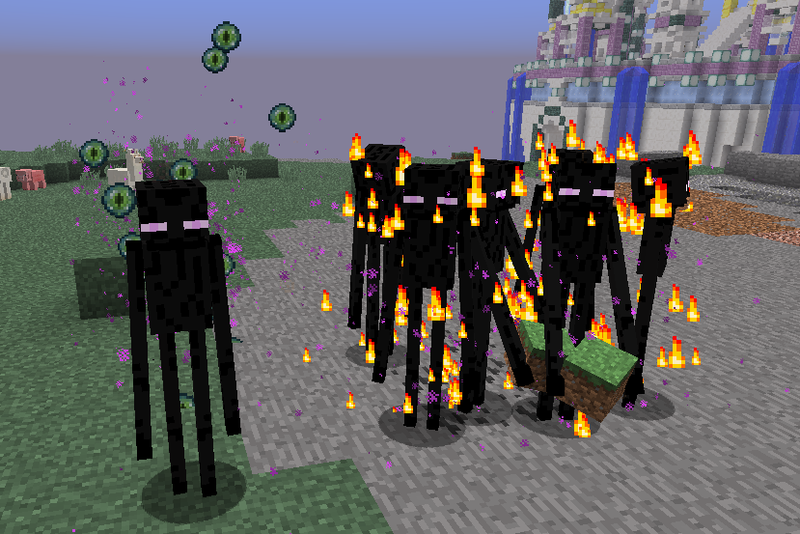 This magic is stored in the Charged Pearls dropped by Eyender’s Enraged Guardian (the enderman version). Use these before striking Eyender to deal more damage to him. Note that Charged Pearls are a temporary item and thus cannot be auctioned. As with all bosses, Eyender will only automatically attack you if you are on difficulty setting 7 or higher. There is a slim chance that Eyender will spawn in your vicinity when you are in the Overworld. The spawn rate for Eyender is roughly once per 24 hours per player. Also note that there is likely only one active boss per world. He will despawn after roughly 9 hours. You can control the chance that Eyender and other Custom Mobs spawn by using your Player Settings (see the /ps command).